It's the US' first house to be made from hemp, the fiber that's harvested from cannabis plants. Funnily enough, it's located in Asheville, North Carolina—but don't drop by expecting to smoke it to get high, whatever you do. 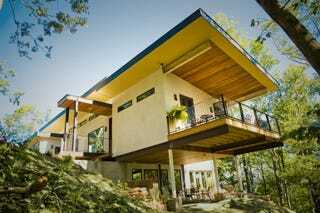 Mixing hemp with lime and water to create "hemcrete," the house was built by eco-friendly construction company Push Design, after successful builds in other corners of the world. In the US, however, the supply isn't that great as it's illegal to produce it, so the cost of importing hemp from Europe makes the whole project much more expensive. This particular house was built using hemp from the UK, and lined with paper panels which are 100 per cent recycled. Apparently it's given neighbors a real green eye, and Push Design has already been contracted to build several more houses—but if anyone was thinking of smoking it to get high, Push Design says that it'd take "smoking 2,500lbs of the hemp to get high," which equates roughly to the master bedroom.